At the end of September, I attended the first session of the Food Change Lab held in Bolivia by the Hivos and IIED Sustainable Diets for All program. The participants formed a patchwork quilt of stories of survival, struggle and joy. Some of them care for family members and do household chores; others sell food at markets and a few even draft laws for the government. But they all have one common concern: to feed their family and themselves, properly. And this is precisely what the Food Change Lab in Bolivia wants to address. What are nutrition challenges for us as women, for our families, for our neighborhoods? What can we improve about what we eat, the way we eat and how we get food? A Hivos change lab** is a multi-stakeholder process where people from different backgrounds gather to identify common problems and then find or create solutions that they themselves are part of. In a lab you can experiment without being afraid to make mistakes. You learn about “prototypes” (models for solutions) and develop discipline as you and the group constantly hone your problem-solving skills. In general, labs aim to stimulate participants’ curiosity and make everyone let go of common assumptions. It was very rewarding to work with such a diverse group in La Paz: 27 women aged 25 to 65 from different neighborhoods; some couldn’t read or write and others had a PhD. We started off with simple exercises, like listening to others without passing judgement. The process then evolved to a deeper analysis of the food challenges for urban women in La Paz. It made me realize how little we listen and how unused we are to being listened to. This type of lab is always provides a space for healing as well as solving problems, and La Paz was no exception. Knowing you’re being listened to opens many doors. Although most of us were strangers, it just took a few exercises to make us open to working together for change. Many of the participants were from low income backgrounds. Some had migrated from the countryside, and some had over six children. This space where the women could speak their minds without being judged helped them share their concerns and ideas without holding back. During the rest of the Lab, the women’s’ ideas will be shared with decision makers in the private and public sector so everyone can come up with solutions for our food-related problems together. In the Lab, a word was used for the first time that nobody actually knew: sorority. It means a group of girls or women associated for a common purpose. Never was a truer word spoken! The major concerns of our participants didn’t differ much from current research on food and nutrition. Their first concern was health, and in Bolivia there are two sides to this coin. While we still suffer from undernutrition, which mostly affects women and children; we also see lots of obesity, which is rapidly increasing and affects mostly women. According to the Bolivian Ministry of Health (PDF, Spanish site), between 1980 and 2014 the rate of obesity in women in Bolivia rose from 8.5 percent to 23.1 percent. The male population’s increase was less: from 3.8 percent in 1980 to 12.4 percent in 2014. The participants’ second concern was time. They all buy and prepare their families’ food, regardless if they work one or even two jobs. According to the UN in Bolivia (Spanish site), the number of women in paid employment has risen to 62 percent. But this has not been accompanied by a redefinition of gender roles within families and society. “Housework” - caring for children, cleaning and doing other household chores - is still seen as the inherent responsibility of women. For our lab participants, this means they have less time for food shopping and cooking, which they believe leads to less nutritious food for themselves and their families. By the end of this first session, we all realized we don’t just have problems. We also have solutions that we can share with the private sector and government policy makers through the Lab for them to take action. This is the first of many other Food Change Labs Hivos and IIED are developing in order to realize our dream of nutritious food for people everywhere. Hivos is committed to a world in which people have access to diverse, healthy food, sustainably produced in harmony with the planet. And women play a fundamental role in making this dream become a real, vital part of the food cycle, from production to consumption. 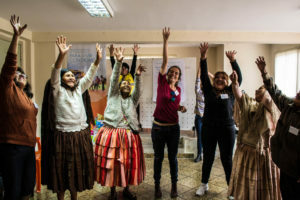 The Sustainable Diets for All program in Bolivia is a joint effort between Hivos, IIED, MIGA, La Casa de les Ningunes and Fundación Alternativas. ** Hivos is running several change labs around the world, some of them also looking at food system issues. For example: the Food Change Lab Zambia, Food Change Lab Uganda and the Energy Change Lab in Tanzania.